Launched by the design house of Elizabeth Taylor in 1993, Diamonds & Sapphires EDT Spray 3.3 oz & Body Lotion 3.3 oz is a womens fragrance that possesses a blend of a fresh cut floral bouquet of lily of the valley, rose, ylangylang, jasmine and spice. A later hint of musky sandalwood. 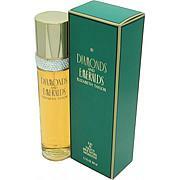 Diamonds & Sapphires is recommended for daytime use. This item may not ship to Alaska, Guam, Hawaii, Puerto Rico, or the Virgin Islands using a ground shipping method. Please select an air method when ordering this item for those locations. All Orders must also have a physical address and not a P.O. Box. Naturel Alcohol Denat., Fragrance (parfum), Benzophenone-2, Bht, Water (aqua), Propylene Glycol, Fd&c Blue No. 1 (ci 42090), Fd&c Red No. 4 (ci 14700), Fd&c Yellow No. 5 (ci 19140). (aqua), Isopropyl Myristate, Fragrance (parfum), Propylene Glycol, Glyceryl Stearate, Cetyl Acetate, Cetyl Alcohol, Cetearyl Alcohol, Algae (algae) Extract, Aloe Vera (aloe Barbadensis) Gel, Shea (butyrospermum Parkii) Butter, Tocopherol, Wheat Germ Glycerides, Acetylated Lanolin Alcohol, Ceteareth-20, Triceteareth-4 Phosphate, Phenoxyethanol, Carbomer, Triethanolamine, Methylparaben, Propylparaben, Cyclomethicone, Dimethicone, Dimethicone Copolyol. I treated myself with the Diamonds & Sapphires set and I just can't love it more. AMAZING!!!!! I was so glad to see this fragrance in your line. It is a fragrance I have wanted for years and I found it here. Love, Love, Love. Thank you. Pleasantly surprised by nice light fragrance. While it didn't last all day for me, it did last several hours. I purchased this product because it had the fragrance spray and the lotion. Fragrance lasts so much longer when you can layer the spray and lotion. I find I need to change up my favorite fragrance (Giorgio Red) every now and again. This perfume spray is great as a change. Now you smell it now you don't. What a big disappointment didn't last for know more then 15 minutes on me. Would send it back but threw out the box.